Since 2016, when I started guiding for Portland Paddle. Primarily sea kayak, although I enjoy SUP. 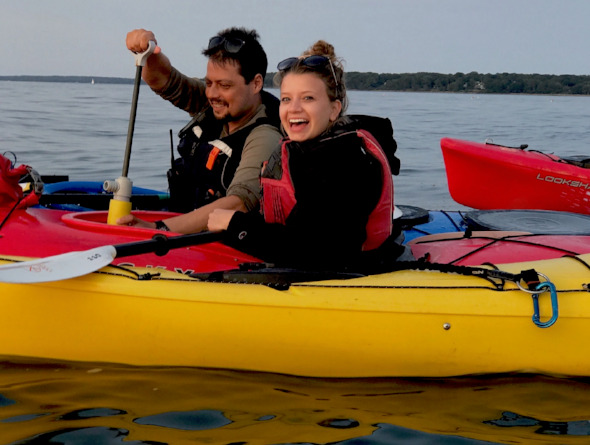 I started sea kayaking after coming back to the United States in 2013. I'd spent the previous four or five years overseas, and wanted to feel a sense of exploration again. I started out taking lessons and renting boats at Portland Paddle, and a couple years later pursued a guide's license so I could join the team. I like being part of the community of guides and paddlers, and the shared commitment to safety and experience on the water. I love taking groups out for half-day trips. With a few hours for a paddle and a picnic, we can share some of what makes Casco Bay such a special place. I co-led an overnight trip to Jewell Island where we landed just in time to get under cover from a ferocious thunderstorm. We thought it was going to be a miserable night on the island. But then the storm faded into the most beautiful panoramic sunset I've ever seen. We wound up having two great paddling days, and some truly memorable island time. I have a waterproof duffle bag from NRS that comfortably fits all of my equipment. I distribute my gear throughout the kayak while setting up for a trip, stow the bag, and then afterward pack everything back into it. It's magic for staying organized. Anything else you'd like our people to know?